The agency reported that many people have been injured and there's a number of fatalities, while several ambulances are currently on the scene. "There are fatalities but information on the number of victims is still not certain," Lusa quoted local mayor Filipe Sousa as saying. Lusa news agency and other media reported, quoting a local politician that twenty-eight people died the accident. According to the Diario de Noticias newspaper, the list of the victims includes 11 men and 17 women. The driver and the guide, both Portuguese citizens, were reportedly injured in the accident. Later, the death toll has risen up to 29, media reported quoting local hospital. The German Foreign Ministry later confirmed that the tourists killed in a bus accident on the Portuguese island of Madeira are the citizens of Germany. "We are shocked to learn about the tragic bus accident on Madeira. Unfortunately, we must proceed from the fact that the victims are from Germany. Our condolences go to the families and friends [of the victims]," the ministry wrote on Twitter late on Wednesday. The ministry also published a hotline phone number for the families of those affected by the crash. — 6W (@6W_es) 17 апреля 2019 г. The incident occurred in the Santa Cruz district at about 6:30 p.m. local times (17:30 GMT). Causes of the incident remain unknown. According to several media reports, the majority of victims in the accident were Germans. 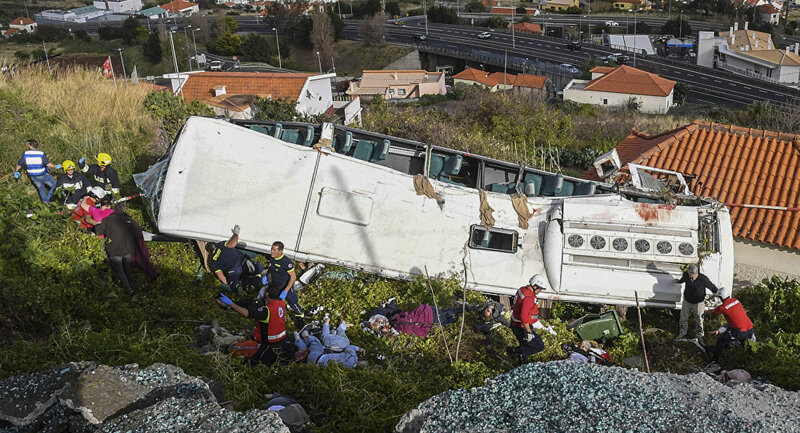 The government of the Portuguese island Madeira declared three days of mourning in the wake of the deadly bus crash. "During an emergency meeting, the government [of the island] decided to declare three days of mourning, beginning tomorrow, due to the tragic events in the Canico area," the government wrote on Twitter late on Wednesday.